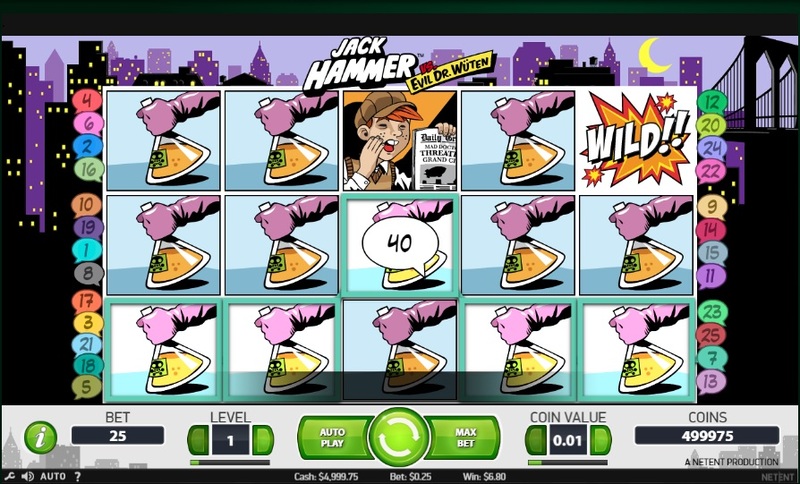 Which online slot machine games to play (12) - Jack Hammer - Casino Inside - The gambling industry magazine! You just can’t miss Jack Hammer. It’s a fascinating slot machine game that has two parts and wins you over immediately. It’s among my favorite slot machine games which I always recommend to those seeking a thrilling adventure. Bang! Pow! Like comic books? You will like this. 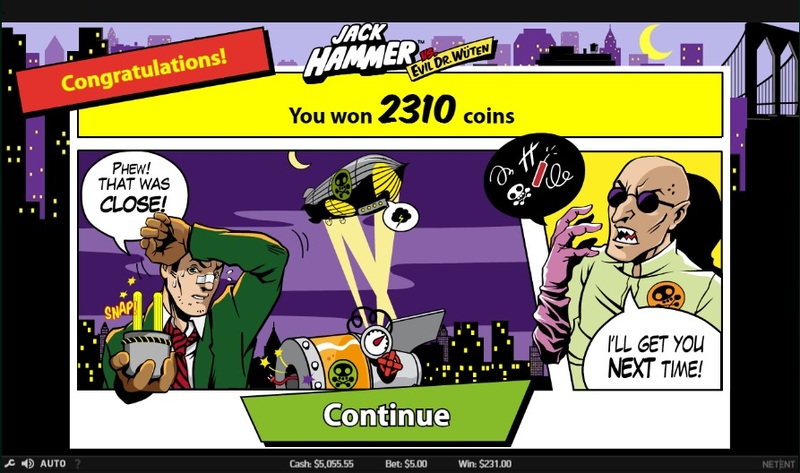 Enter the mob world of a criminal saga of the cellulose phenomenon: Jack Hammer. 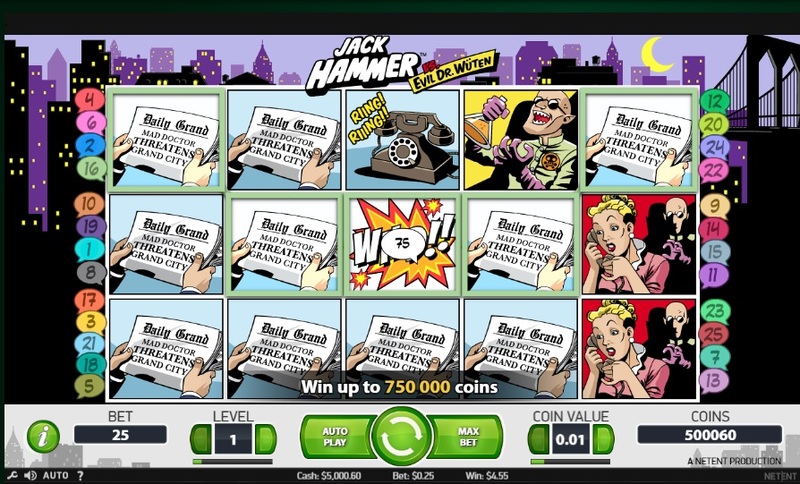 This slot is inspired by the classic stories in comic books, with diabolical criminals and hard to fool detectives. It is a battle between intelligence and cunningness. Jack Hammer against the evil Dr. Wuten. Good vs. Evil, you already know the cliché. The law against the lawless. And you are the warrior caught in the middle. This is not the only challenging aspect. Regardless if you are a police inspector or the paper boy, everybody gets shot for a paycheck! In Jack Hammer, each symbol rotates independently, offering a total of 15 spin rolls. The game has a Sticky Win feature, in which the rolls with the winning symbols are stopped and all the other re-spin for a chance at higher winnings! And of course – free spins! 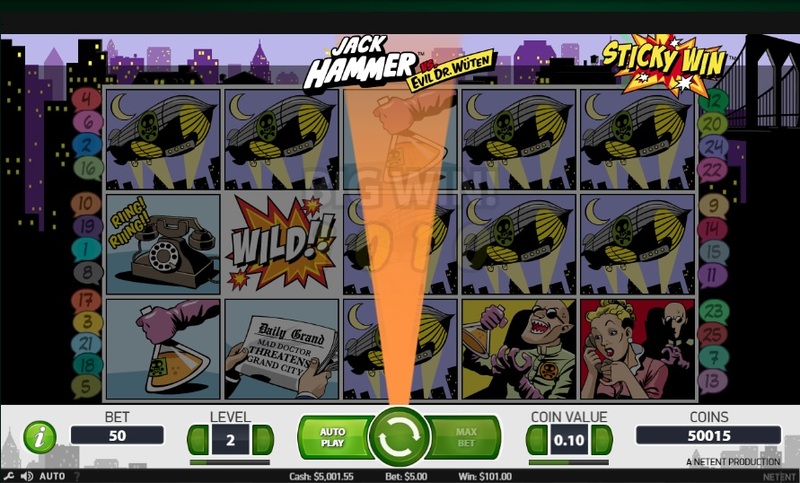 Jack Hammer is a video slot with 25 lines, 3 rows, which use 15 independent rolls. 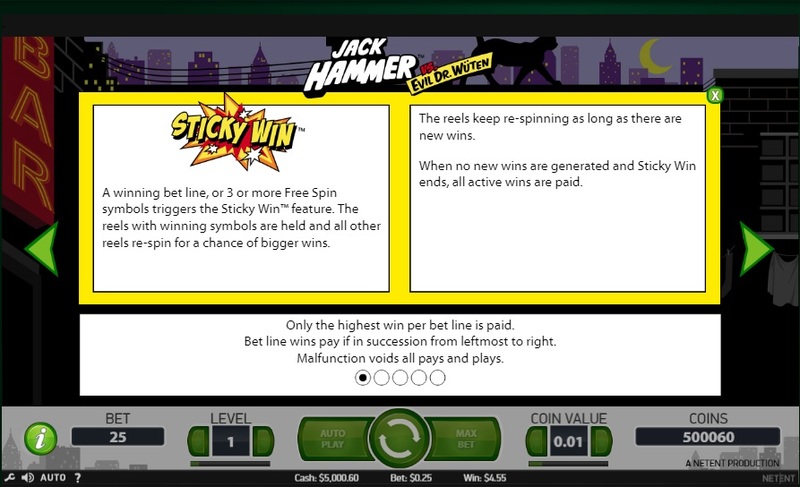 The game uses Sticky Wins, Free Spins and Wild substitutions. The game is played on 25 (fixed) stake lines, to 1-10 stake levels and different coin values. It’s a slot which is considered to have a low level of volatility, the RTP being of up to 96.96%. 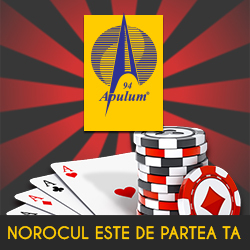 The game was launched in 2010 and is available on desktop and mobile devices. I started out with 5000 coins, playing at minimum value. The most important option of the game is the Sticky Win. When 3 symbols of the same kind appear in a winning line, this option is triggered automatically. That is the winning symbols are kept and it keeps going until the winning sequence is completed or blocked. I pulled a few times on the stake with which I started out and caught a newspaper sequence. First 3, then 4, 5 and so on, until a somewhat greater win. I continued to play at the same stake. After multiple spins, an interval of 5-10 minutes, I almost caught a board and went back to the amount I started out with. Very close to a complete board, unfortunately, the test tube not being one of the top symbols. That was also the moment I slightly increased the stake on level 2, with increased value of the coin and slower spins. However, I did nothing more than just maintain the starting coins. I wasn’t losing too much, nor was I gaining too much. After more than 10 minutes, however, I caught the toxic balloons, one of the most sought after symbols. After other spins, I finally got the Freespins. To be fair, I had been waiting for them for a long time. 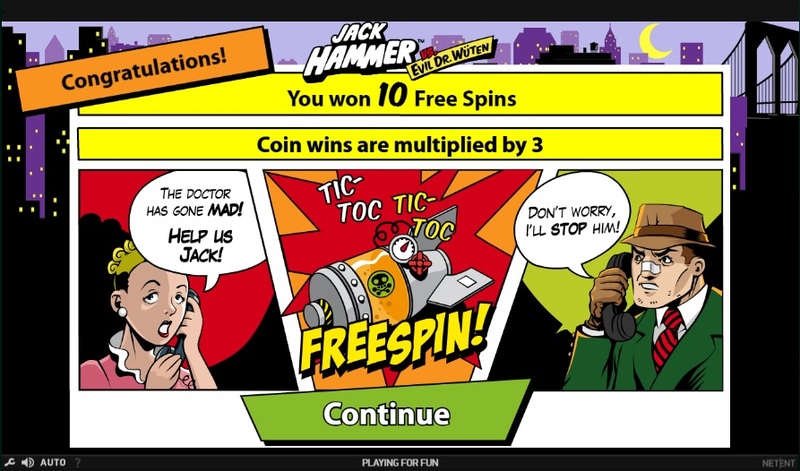 10 free spins with a times 3 multiplier. It was a very significant win, but it got me back to the starting amount.